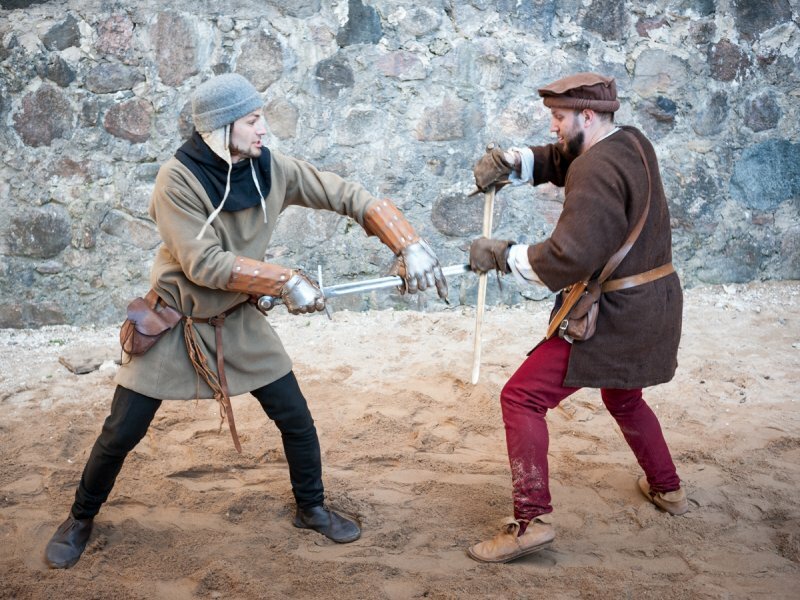 Find more information about Medieval activities in Livonian Order Sigulda Castle here! Originally built eight centuries ago, the castle reopened it’s walls to visitors in 2012 and now encourages everyone to step back in time and enjoy the surroundings that bore witness to many historical events. In the ancient Gauja valley, shaped by the River Gauja and its tributaries, dozens of stone castles were erected and occupied in addition to the many castle mounds that were built by earlier locals. This area has the greatest concentration of castles not only in Latvia but also in Eastern Europe. Geographically, the Gauja valley played an important role during the Crusades due to its existing network of waterways and land roads that were already in place. The valley was also home to a variety of ethnic groups who each controlled their own lands. During the 13th century many new territories were established on the basis of war and battle. Sigulda Medieval Castlewas built by the Livonian Brothers of the Sword who were later incorporated into the Teutonic Order of the castle, thus the castle eventually became the property of the Livonian Order. The Livonian Brothers of the Sword, officially known as The Militia of Christ of Livonia, was a military order comprised of German “warrior monks.” They later became better known as the Livonian Brothers of the Sword due to the symbols on their white capes: a red sword and cross. The order, founded in 1202, was the first “warrior monk” order formed outside the Mediterranean region. Historical documents indicate Bishop Albert and Cistercian Abbot Teoderih were the co-founders of the order. The military order’s mission was to remain in Livonia to protect the land and conquer new territories. As part of the land division between themselves and Bishop Albert in 1207, the order gained the territory which stretched along the left side of the Gauja River. In the ongoing competition to determine hegemony between the Bishop and the Livonian Order, castle placement became a strategic factor. According to the Rhymed Chronicles, Sigulda Medieval Castle was erected sometime between 1207 and 1209 under the direction of Master Venno of the Order of the Brethren of the Sword. The Chronicle of Henry of Livonia says that the castle was in use by the Brothers of the Sword as a base while battling revolting Livs that were invading from a nearby castle. Sigulda Medieval Castle was initially built to monitor and control the water ways of the Gauja River and to fend off any invasion attempts from the nearby bishop’s castle in Turaida which was located on the river’s west coast. In 1224 the Pope’s legate, Wilhelm of Modena, stayed at the castle and established both a church and parish. In 1237 the lands of the Livonian Brothers of the Sword become the property of the German Order who continued to conquer additional territories in Latvia up until 1290. The Grandmaster was the highest officer of the order, followed by the Livonian Master. Both, the Grandmaster and the Livonian Master were elected for life by the Generalkapitel. The Livonian Master lived in the Cesis Medieval Castle, which was the second most important castle in Latvia, after the Rigas Castle. At the very beginning of the Livonian war, Sigulda Medieval Castle was damaged and in 1562 it became a part of the Polish Starostwo. At the end of the 16th century, the Poles repaired the castle and its surrounding buildings. During the Polish – Swedish war the castle was seriously damaged. After the war, the Swedes reported that the castle was empty and destroyed. In the 1622 it was again restored and a new residential building and sauna were built. In 1625, the King of Sweden bestowed Sigulda as a gift to Count Uksensem, however, after the manor house reduction program it once again became state property. A layout of Sigulda Medieval Castle, created around 1680, is stored in the War Archive in Stockholm. The castle was abandoned again during The Great Northern War. In 1737 Sigulda became a private estate. It was first the property of Count Lasi, followed by Brown and the Borhs. In the 19th century the castle and its layout were remodeled and a gate, inscribed with the year 1867, was added to the front part of the castle. The gate tower surrounding the inner castle building was decorated with the Broh family coat of arms. Additionally, the ruins of the castle were fortified and two pseudo-gothic arches were constructed. Finally, between 1878 and 1881, a new castle was built by Duke Kropotkin’s family. Sigulda Medieval castle is situated on the edge of the ancient Gauja valleys on a projection formed by three steep slopes. A deep ditch at the south side of the castle was constructed to protect the castle buildings by separating them from the rest of the land. The castle sits on a highland and is naturally protected from invaders by high, steep slopes. Special ponds were created to secure the castle’s southeast side. Sigulda castle was originally built as a castellum or Roman-type watch tower and was later modified. It consisted of several interconnected structures which included a central building or castellum, an inner castle forepart and an outer or southern forepart. The building of Sigulda castle can be divided into several time periods. Construction started at the beginning of the 13th century. The first building was of rectangular shape and made of dolomite blocks with 3 meter thick walls. Below this, a large basement was built, 10 x 9.5 meters, with a roman style column in the middle of the room supporting the vault. A fragment of this building remains today as it was cemented into the southern wall of the castellum that was built later. According to historian Tulse, the second stage of construction occurred during the last quarter of the 13th century through the end of the 14th century when the square-shaped central complex or castellum with its inner courtyard surrounded by three buildings was erected. This converted the former castellum into a typical convent-type castle. Local stone was primarily used for construction although the walls and certain architectural elements were made of dolomite and limestone. The three-story high, south-west section of the convent building survives to this day. The chapel, which was ten meters wide and had Gothic window lintels and a lancet arch, was located at the southern end of the second floor. Its wall was decorated with a cross. The third floor was used to store weapons. In the second half of the 15th century, as firearms evolved, the machicolations on the battlements were rebuilt and the chapel and hall on the south complex second floor got larger windows. The central castle complex was surrounded by an inner fore-castle in the shape of a irregular square measuring 80 x 100 meters at its widest part. The square shaped towers projected out from the wall surrounding the southern side of the forecastle and its northeastern corner. The outbuildings along the side yards were built in the 17 century. Downstream, another wall was built to secure the inner fore-part of the castle. A small wicket gate at the north side of the inner forecastle leads to the Gauja River. The main entrance, at the southern side of the castle, swept through a four-story high gate tower that was built around the year 1400. At the forefront was a drawbridge with a tower sitting on the opposite side of the ditch. A vaulted entrance on the southwest wing of the castella connected the inner yard of the forecastle with the inner yard of the castle. The lower part of the castellum was guarded and occupied by servants. The hall, built in the Gothic style, was located on the main floor. A chapel was constructed on the southeast side of the castle. The storage rooms with weapons and the machicolations were built above the main floor. Records show that the forecastle use to be three times larger than the inner castle or main building and was surrounded by a wall with a gate in the southern wall. Architectural plans dating from the 17th century show the outbuildings and yards use to be located in the outer forecastle. The structure of the main castle began to weaken around the 17th century. At the beginning of the 19th century the castle once again got attention but, following the trend of the times, it was simply admired as a romantic ruin. Monument protection concerns caused some construction work to be done in order to renew the gate tower and other important parts of the castle. Due to its importance as a tourist attraction, the castle walls have been fortified many times in the 20th century. After WWI with the establishment of Latvia, the ruins have been under the auspices of the Monument Board. Several history researchers simultaneously became interested in the history of the building of the castle. In 1922, Karl Woldemar von Löwis of Menar, a researcher of Baltic-German origin, found a revised reconstruction plan for the castle, dated from the 17th century. It is currently housed at the Archive in Stockholm. Estonian art history researcher, Armins Tulse, discovered information related to the actual construction. In depth research and renovation of Sigulda castle began in 1962. Measurements were made of the construction plan, facade and wall details. A topographic plan of the castle and its surrounding was created in 1978. Historians used photo-fixation techniques as they collected all available castle data. Archaeological excavations of the ruins were supervised by Normunds Treijs from 1987 to 1988 and by Jānis Ciglis in 1997. Architect Tatjana Vitola devised a method for fortifying the castle walls which has been used several times since 1962. In 2011, the European Union co-sponsored a project designed to assist with the renovations. 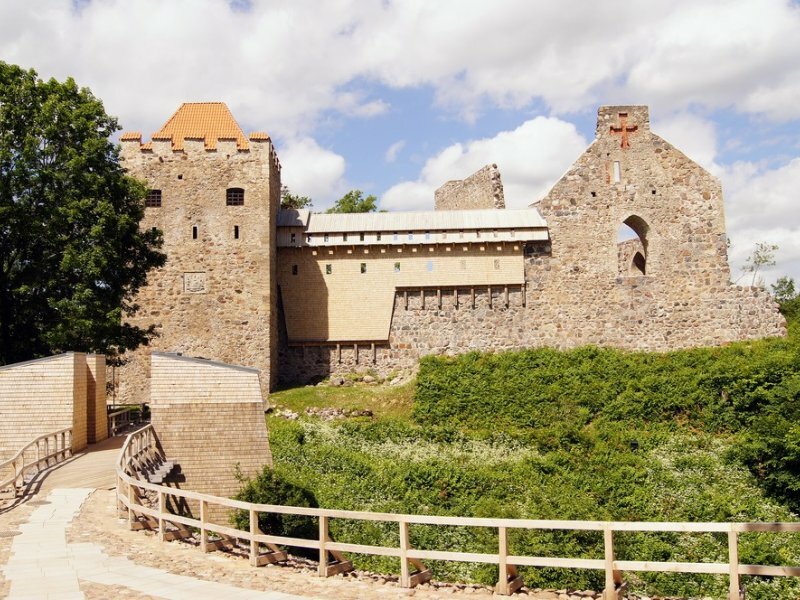 It was officially titled “Reconstruction of Sigulda Castle Ruins and Infrastructure Adjustment for Tourism Development” and successfully concluded in 2012. All of this has resulted in the reconstruction of the castle ruins and it’s surroundings which makes it a unique tourist attraction combining a rich cultural history in an ecologically clean environment. You are welcome to climb up into the Castle’s southern and northern towers which have been opened for the first time since the renovations. Take a walk on the walls of the ruins to enjoy the pristine atmosphere and the beautiful views of Gauja river valley and the nearby historical monuments. The technical part of this project was executed by the office of Inara Caunite. 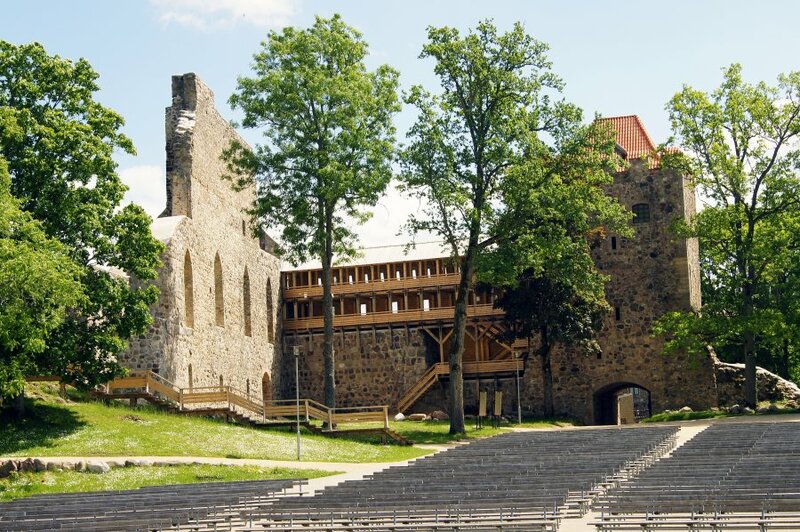 Annual concerts and festivals are organized on the open air stage of Sigulda castle-ruins. The season traditionally opens in May with the Cherry Blossom Ball followed by the Jazz Festival, Blues Festival and Theater Day. The most remarkable event is the Opera Festival, originally initiated 20 years ago by Dainis Kalns and held in Sigulda ever since.